Juan Carlos Merla Rodriguez was born in Monterrey, Mexico on the 10th Day of January, 1951. This recognized artist was awarded the Honorable Mention at the Prestigious Fourth Biennale of Painting, Sculpture and Installation of Monterrey. His work, like the one of his contemporary, Rafael Calzada has been described as melodious and rhythmic. He studied at the Taller de Artes Plasticas at the Universidad Autonoma de Nuevo Leon. He has also studied in London, Houston, New York, Barcelona and Madrid. 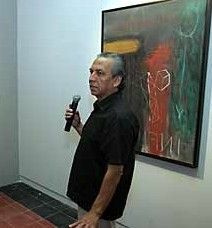 His work has been shown extensively in Mexico and the US and is part of the FEMSA Collection in Monterrey, Mexico.